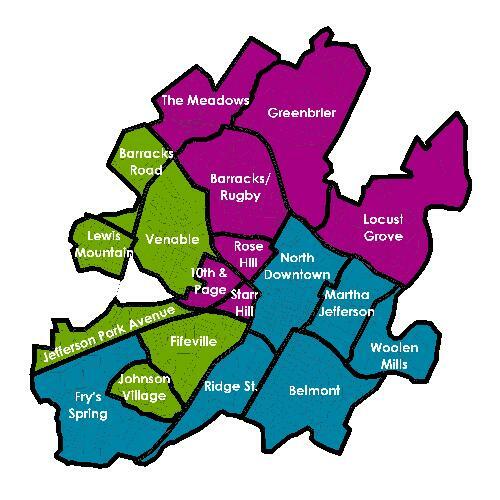 For planning purposes, the Charlottesville is divided into 18 neighborhoods by the Department of Neighborhood Development Services. Within and among each of these neighborhoods, many vernacular names (a.k.a. colloquial) are used for neighborhoods as well. Neighborhoods recognized by the city. Some of these neighborhoods are still in existence, but were given new names. Others, like Vinegar Hill, were demolished and rebuilt over time. Refer to Historic districts category for additional information related to history of individual neighborhoods. ↑ Neighborhoods: Design Day Charlottesville Community Design Center retrieved 7 Jun 2009. ↑ Charlottesville Neighborhoods, City of Charlottesville, retrieved 7 Jul 2009. ↑ NEIGHBORHOOD ASSOCIATION NEWS AND WEB SITES, City of Charlottesville retrieved 7 Jun 2009. ↑ retrieved 26 Sep 2018. This page was last edited on 10 December 2018, at 15:00.